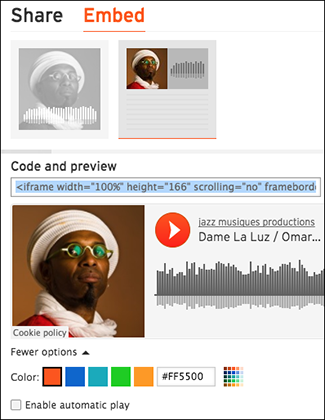 You can add any SoundCloud audio track or playlist to your website by embedding a bit of code from SoundCloud. You'll need to create a SoundCloud account to use this feature. Click Audio in the Add Section panel. Note: You can add no more than one Audio section per page. 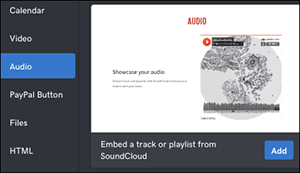 Click the SoundCloud layout you want to use for your new Audio section. Once new audio section appears, click the Audio panel again to begin customizing its settings, starting with replacing the SoundCloud Embed Code. 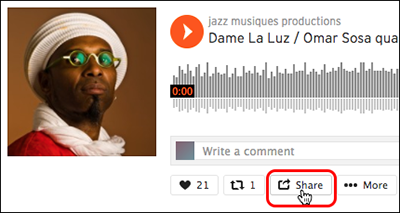 To get the necessary embed code, open a separate web browser tab/window, go to the SoundCloud site to sign in or create an account, then search for a track or playlist that you want to add to your Audio section. When you find the track/playlist, click the Share button. Click Embed, choose a layout if there's more than one, and set the layout's options at bottom of the window, such as size, color, or automatic play. Note: Some tracks/playlists will not have an Embed option, just Share. 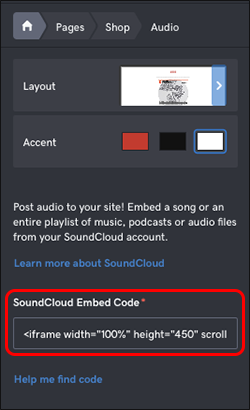 The Audio section cannot use a Share code, so if there's no Embed option, find another track/playlist to use. Once you've done that, copy the Code and preview field's content. 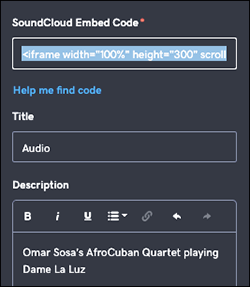 Switch back to the Audio panel in your other browser tab/window and paste the copied code into the SoundCloud Embed Code field. Change the Section title and fill in the Description field if you like. Any changes are saved automatically, so when you're finished, click Preview and then you can press the play button to hear the track/playlist. How can I add audio files in website builder?